This picture looks like a study of the light in all its forms: In the vibrant play of reflections over the walls and in the fall of the light shadows across the floor, the light almost seems to dissolve the fixed boundaries of the room. At the same time it takes on its own fixed form, penetrating with such strength and presence that it manifests its own reality. Almost tangibly, it falls in from the window and lies like a geometrical form across the floor. At once visible and non-material, it takes on a mystical quality captured in the concrete scene. 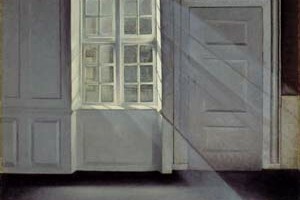 Hammershøi in fact called the picture purely and simply Sunshine or Sunbeams when he exhibited it. It was only later given its more lyrically narrative title Dust Motes Dancing in the Sunbeams. Hammershøi was the last great painter in Danish nineteenth-century art. He painted against a background of modern experience, but his painting never broke with the basic rules that had defined the point of departure for the pictures of the Danish Golden Age. His work therefore has a distinctive, striking character which expresses both his independent artistic temperament and a longing for the Golden Age whose foundations had been reduced to ruins. In 1898 Hammershøi moved with his wife Ida to the house on Strandgade 30 where they lived until 1909. The intimate artistic association with central Copenhagen gave his art a new direction. Whereas his motifs had formerly alternated between figure and landscape painting, this location truly made Hammershøi a painter of interiors. The rooms became his constant source of subjects, and the walls and windows that formed the boundary against the world almost literally became the background for his painting.